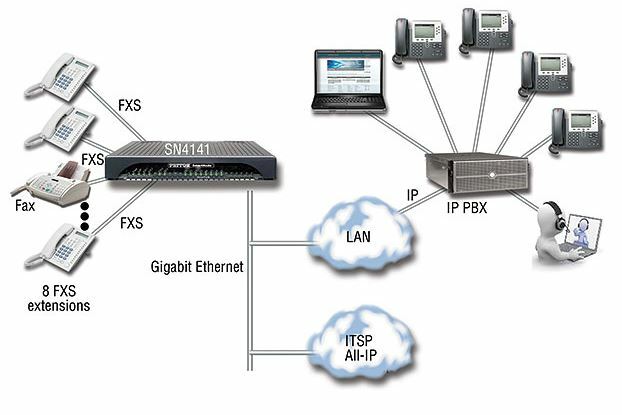 The SmartNode 4140 Series of VoIP Media Gateways support up to eight phone or fax calls. The SN4140 is the perfect choice for All-IP applications where either old, non-replaceable telephones have to be integrated into a UCC environment, or for good old fax devices to be migrated to the next-generation network infrastructure. Patton’s SmartNode 4140 Series delivers the legacy phone interfaces, service transparency, and flexible integration required for All-IP networks. In All-IP networks as well as during the migration to the next generation communication network, legacy Telephone equipment will remain for quite some years. The SmartNode 4140 Series will be responsible integrating this equipment at a very low cost for the enterprise. With its modem and fax signal to VoIP conversion capabilities it also helps to solve problems integrating PoS, metering systems, elevator phones, etc., into an All-IP environment. *** Supports up to 256 SIP-to-SIP sessions under ideal conditions. Transcoding, debugging, and/or IP routing reduce processing capacity. Copyright © 2019 Patton SmartNode VoIP.